I LOVE this series! 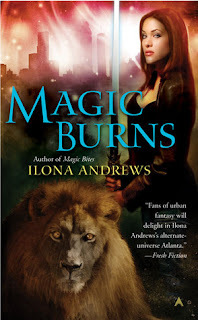 The Ilona Andrews duo never ceases to amaze me, and I hope they write books together forever! I first discovered this writing team when I read Burn for Me, which is part of their Hidden Legacy series. When I ran out of books to read in that series, I went searching for something else to replace it and stumbled across their Kate Daniels books. I read the first book (read my review here) and knew it was going to be wonderful. The world-building is fantastic, the characters are complex and detailed, and the stories have been engaging and action-packed. Curran is everything I want in a male character. He's clearly an alpha, and doesn't hesitate to put people in their place. I think he secretly enjoys it when Kate challenges him, despite her clearly being the weaker opponent. Yes, she has magic at her disposal, and she's good with a sword, but Curran is fierce and acts with an animal's instincts. Their back-and-forth banter is one of my favorite things! They like each other, but haven't admitted their feelings to anyone. It's apparent in the way they choose to interact, even if they're never overly obvious about it. I really enjoy all of the secondary characters, no matter how small their roles are within the book. Derek is clearly a teenager, but he has a lot of responsibility within the Pack, and he takes his job very seriously. I like that he's usually assigned to guard Kate (per Curran's orders), and think the two have a lovely working relationship. He's sweet and dependable, always loyal to the Pack, and fiercely protective. Ghastek is rarely there as a human, because he's almost always piloting a vampire, but I love his dry sense of humor and how he teases Kate throughout the book. They get along for the most part, but working alongside a vampire is never easy (though there are some benefits). It's eerie what a vampire can do, and there is always the possibility of Ghastek losing control. Andrea is a new favorite of mine, and I cannot wait to see her in future books! She and Kate share a secret, which only solidifies their friendship, and I hope Andrea is involved in future adventures. Even people that are only mentioned once or twice feel significant. It's really amazing! I'm always surprised by the story and rarely anticipate the direction it will go. There are vampires, shifters, witches, gods, mythology, giant turtles -- it's almost impossible to imagine what will happen next! I can never listen to the audiobooks fast enough, and I'm always eager for the next one as soon as I'm finished. It's a bummer there is a wait list at my library! If you haven't heard of this series or these authors, I highly recommend you check them out! They've written some amazing things, and I look forward to reading whatever they come up with next. Okay, I think you've convinced me to try this series now! I have to read the last 2 books still but this is a great series. Andrea has a book too and it was great.